Come join us for our annual spaghetti dinner and show in Duarte! Hello LAFCM Past, Present & Future! 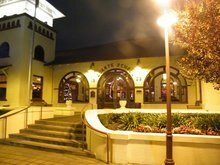 It's that time of year again when we all gather at the Old Spaghetti in Duarte for wonderful fellowship, dinner and a Magic show put on by our own members. I need everyone to begin thinking about who you are going to invite to join us this year. Think about your family, friends, co-workers, neighbors, clients, church members or even that cashier who checks you out every week at your local supermarket. Everyone is invited! The more the merrier! We are responsible for 35 meals regardless of how many people show up, so the more people we invite the better for our bank account! It's time to select your meal and email it to me at michaellafond@hotmail.com so that we don't tie up the LAFCM email with unnecessary communications. I will acknowledge all incoming emails so if you do not get a response from me either email me again or call me 626-251-0540 but allow me 24 hours to respond before calling. All orders are due by Friday 12/7/18 by 4 pm. No additions or changes will be accepted after this date and time so please don't wait until the last minute to communicate please, please, please. For #4 (Any two choices for adults any one choice for the kids) refers to the sauce selections. Choose from any of the sauces below.. I will need each persons first & last name and their dinner selection including the Salad Dressing. Here is a sample of the information I will need for each person attending. Cost for dinner and show is $20 per person and $10 for children 10 years old and under. 9:00 pm - Farewell and Merry Christmas! We will also have a magic show and for (5) members who would like to perform, Please contact Barney Kinard at barney@kidhelper.com. Depending on how many performers we have will determine how much time each person will have to perform. Please let me know if you would like to perform as soon as possible. For any further questions, Please email me directly at the email address below. Thank you and I hope to hear for everyone soon with their long lists of people!